DO YOU GET LOW BACK PAIN FLARE UPS, SPASMS & EPISODES? I’ve suffered through excruciating low back spasms, flare ups and episodes, off and on for years. I’ve been stuck in bed, or on the couch for days. I’ve had to miss work for extended periods. None of it worked for me - at least not more than temporarily. The pain, spasms, and flare ups always came back. Has any of it worked for you? If you know me even a little bit by now, you know I’ll admit to being a HUGE MEDICAL RESEARCH NERD! After nothing worked to help me fix my low back pain, I hit the books. I set out to find the answer to my lower back pain myself, using scientific research and medical studies. I pored through hundreds of papers, studies and medical journals. What I found was interesting and unexpected, and it led me to a real solution to low back pain! Low back pain is rarely caused by injury or weakness in the low back! Most of us don’t move important areas of our bodies enough on a day-to-day basis, like our hips, hamstrings, joints, back and shoulders. When we don’t move these enough, they become weak and unable to handle the movements they’re designed to handle. So, for example, when we pick up a heavy box, or we do a long jog, or pick up our kids the wrong way… these muscles and joints that are supposed to help us with these movements, can’t do their job. When this happens, your body has to make instant adjustments to compensate for this inadequacy. In a lot of these cases, it asks your lower back to “chip in” and help out. ...and this is what low back pain flare ups, spasms and episodes really are. Your low back won’t have to carry the load of “big” body movements on its own anymore, because these other areas will be better supporting it. This means no more flare ups, spasms, or episodes in the future either! I designed a simple exercise program that can help you do all of this... in just 11 minutes a day! And, it’s so easy and gentle that virtually anyone can do it! I’d like to invite you try my “Low Back Pain Solved!” program. ...that I will give you your money back if that doesn’t happen! If you aren’t totally ecstatic about the results you have, just email my team at support@ExercisesForInjuries.com or call us at (888) 291-2430 anytime within 60 days, and we will send you your money back and you can keep the course for free, as my thanks for giving it a try! Other areas of your life have started looking better and seeming a little easier too - like your work, your relationships, even your finances! It has already happened for many of my clients and students. Why does this system work so well to reduce and eliminate low back pain? ...because it includes 8 different approaches to healing and strengthening your low back and all the surrounding areas that affect it - no stone is left unturned! Because we attack the problem from so many different angles, and with so many different approaches, your low back pain has nowhere to hide, and can’t survive! First, we do some very basic muscle relaxation, so we can start reducing your pain as quickly as possible. These gentle positions and movements will naturally relax the muscles in the low back and surrounding areas, which will release your spasms, tightness and cramps, which will decrease your pain quickly! Self-massage is a great way to quickly reduce the pain in your low back. It also decreases stress, tightness and tension in your hips and mid-back, which stimulates repair, healing and strengthening - so it’s very important to do regular self-massage - and it feels good too! In the program, I’m going to teach you many different self-massage techniques, most of which you can do in minutes with just your hand or regular household items. In this component, we’ll use some light dynamic stretching that will get us warmed up and ready for the upcoming exercises. These dynamic stretches also let our body know that it’s safe to move the low back again, without further injury. This is very important because in a low back flare up, your body and back are tightened and cramped because they’re protecting you against future damage and injury, but this tightening causes terrible pain and makes it very difficult to move at all. Here, we’ll work on activating and strengthening the abdominal area - specifically those deeper transverse muscles that sit right up against the spine. These super-easy movements can be done by virtually anyone, and they’re important because they help create more support and stabilization for the spine and low back. In this component, we’ll work on increasing the mobility and range of motion of our mid-back. These movements are easy as pie! All you have to do is lie or sit, and then bend or rotate your body slightly. These movements condition the mid-back to “hold its own” more, so it doesn’t need to rely as much on the low back for additional help. This removes extra stress and strain from the low back, freeing it up to be relaxed and pain-free! In this component, we’ll work primarily on the piriformis muscle - one of the rotators of the hip. We’ll do a few simple and easy stretches that help loosen this muscle (and a few others that rotate the hip), so there is less stress and strain on the low back. Here, we’ll do some easy and gentle movements that engage and activate the hip while we stay in good upright alignment, so our body gets used to using all of the available muscles to support full body movements, not just the low back. We’ll strengthen the hip and surrounding muscles, so your low back has a full support system running 24/7/365! In this component, we want to stretch out the hip flexors. We’ll use dynamic stretching in the beginning, focusing on the gluteal muscles, which will get us ready for the static stretches that we can hold for longer, which loosen, strengthen, and activate the hip flexors. If you’re worried that any of this sounds advanced or difficult - DON’T WORRY! 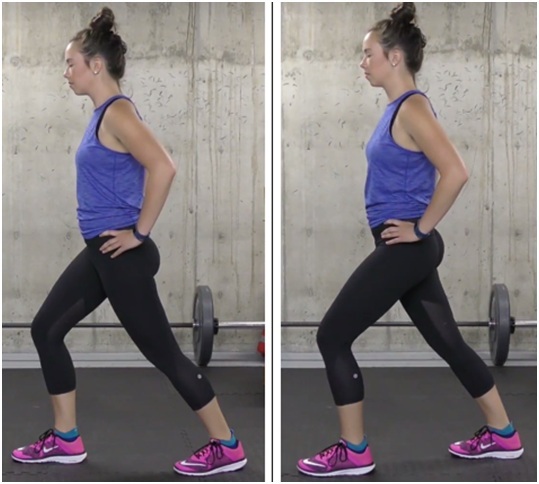 All of these movements are very easy to do, even if you have severe low back pain. Get INSTANT ONLINE ACCESS to the digital version of the Low Back Pain Solved program. You get lifetime access 24/7/365 to everything, on any computer or mobile device. 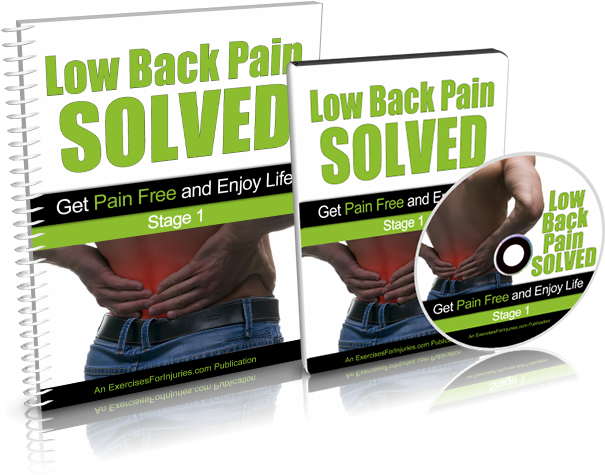 Get INSTANT ONLINE ACCESS to the digital version of the Low Back Pain Solved program. You get lifetime access 24/7/365 to everything, on any computer or mobile device. AND we'll send the physical version of the program to your home - it includes 2 DVDs and a comprehensive printed manual. *Plus shipping & handling of $12.95 for U.S. addresses and $26.95 for International. The 10 “red flags” you must look for anytime you have a low back pain flare up, spasm or episode >>>>> If ANY of these are present, YOU MUST SEE A DOCTOR AS SOON AS POSSIBLE! The ideal “alignment” our body wants to be in, and operates best in. Most of us spend most of our time “out of alignment”... but there’s an easy fix. In the program, I’ll show you what it is, so you can avoid future low back pain episodes. Why you’re more likely to get low back pain flare ups in the future if you’ve already had one… and what you can do to prevent this NOW! NEVER do these two things when you’re tired… Two DANGEROUS ways we all MOVE OUR BODIES DIFFERENTLY when we’re tired, that cause low back pain flare ups, spasms and episodes! Why I have you spend more time strengthening, lengthening and activating the muscles in and around your hips than your low back. This is crucial to understanding where low back pain REALLY comes from! 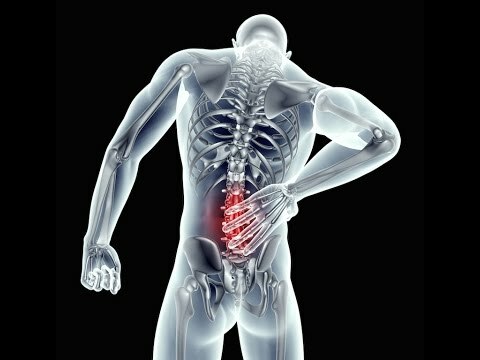 Why just educating yourself on low back pain can radically reduce your recovery time! I’m going to give you all the facts about low back pain, so you can speed up your recovery time. 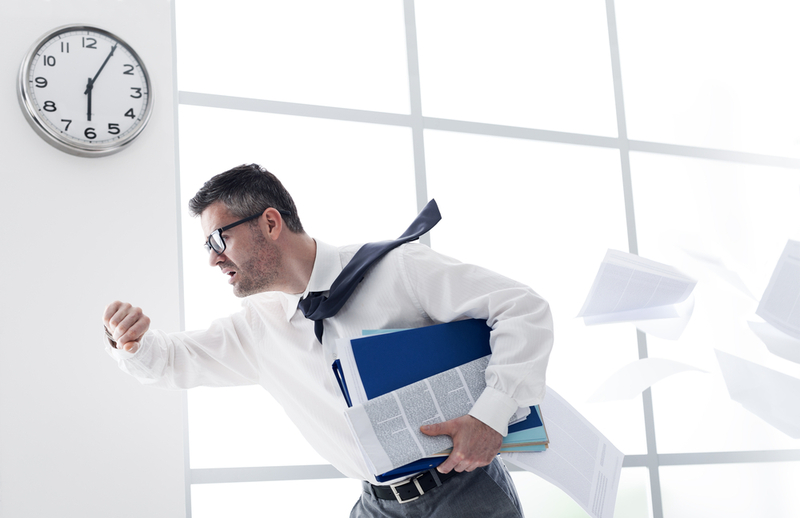 You’ll learn counterintuitive facts about: activity, aggravating factors, expected time for improvements, and more. The 4 things I tell all my clients to do when they get a low back pain flare up, spasm, or episode... these things just work! How my unique 3-stage exercise program makes it so that virtually any person can use this program to fix their low back pain, FAST... even people who have severe low back pain… even people who have never exercised a day in their life! The 3 different stages also allow you to self-direct your progress so you get the fastest possible recovery. A simple trick to know exactly when to change exercises, or increase the difficulty level, so you get the fastest recovery time possible. Your mental state, when a flare up occurs, determines how fast you recover! In the program, I’ll tell you the most common, and most dangerous thoughts and beliefs that keep the pain hanging around longer! And I’ll teach you how to change your mindset about low back pain, so it goes away MUCH, MUCH FASTER! It’s very important, before we get started, to assess your current condition. This is the first thing I do every time I see a new client with low back pain. We need to know how much pain you’re experiencing now, how serious your injury is, and what range of motion you can currently handle. Having this information will prevent further injury, and help you get the best possible results, in the shortest amount of time. In this component, you get a 17-minute video and a brief manual that walk you through, step-by-step, exactly how to do your own self-assessment. Based on this information, you’ll know exactly where to start in the program. You also get a convenient Fill-In Sheet that allows you to write each of your answers and assessment results down as you watch the assessment video and read the manual. 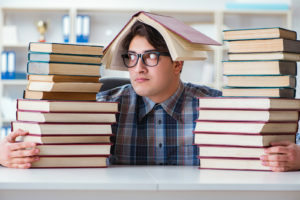 The “Low Back Pain Solved!” program contains a wealth of educational information on low back pain flare ups, spasms, and episodes, but I want you to come up to speed FAST on what you need to know, so you can get started FAST, and start reducing your pain FAST! So, I’ve distilled the educational content down to the most important summary points you need to get going right now. In this Quick-Start Cheat Sheet, I give you a brief overview of low back pain flare ups, spasms, and episodes. I explain, in plain English, what causes them, what the common symptoms are, which activities make them worse, and some important tips for healing fast. 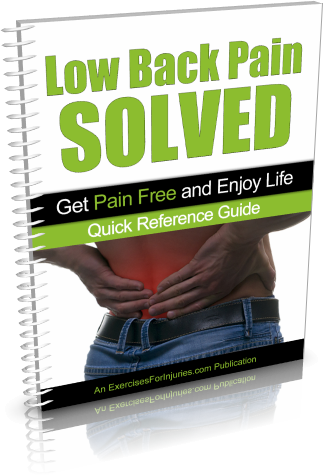 The “Low Back Pain Solved!” is a comprehensive program of gentle, yet highly-effective stretches and exercises designed to reduce and eliminate your low back pain quickly, so you can get back to your normal, active life. First… don’t be scared or overwhelmed by the fact that this exercise program has 3 stages. If you follow the instructions and do just the Stage 1 exercise sequence, which will only take 11 minutes each day, you should feel a significant reduction of your low back pain within 7 days. I want to help you completely eliminate your low back pain, and I’m giving you a comprehensive 3-stage exercise program so you have the best possible chance of that actually happening. The 3 stages progress from very easy (Stage 1) to more challenging (Stage 3). This 3-stage structure makes it so that virtually any person can complete this program, even those who are experiencing severe pain, and even those who have never exercised a day in their life. The 3 different stages also allow you to self-direct your progress so you can get the fastest possible recovery. This is because, in order to get the best possible results, in the shortest period of time, it is critical that you learn to do these exercises and movements the right way, in the right sequence, with the right amount of intensity, and for the right length of time. ...so you can do it consistently, until your back pain is healed for good. 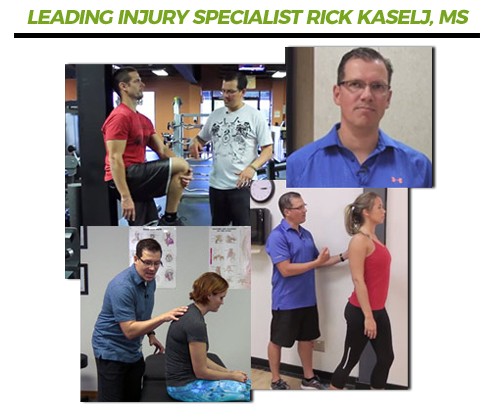 As mentioned above, for each of the 3 stages in the “Low Back Pain Solved!” program, you get an instructional video, a follow-along video, and a comprehensive manual. I am including another way for you to get direct access to me - for getting your questions answered, and also for inspiration, motivation and accountability. 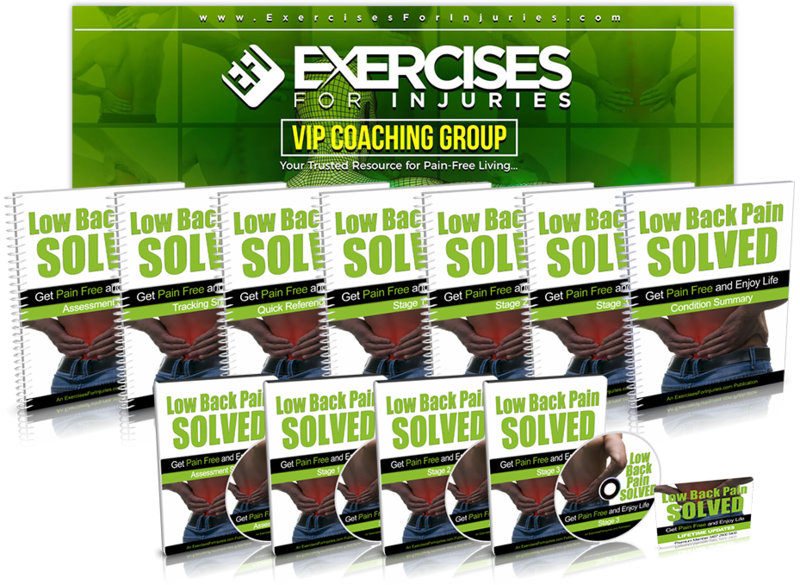 If you purchase the “Low Back Pain Solved!” program, you will get exclusive access to EFI’s private, secret Facebook group. In this group, you get the opportunity to ask your questions, about your specific situation, to me and my team of health and fitness experts, DIRECTLY. You also get to see the answers we give to other members of the EFI VIP coaching group - these can be surprisingly helpful even though you didn’t ask them. You also get the chance to meet new friends and become part of a supportive community. Most of the people in EFI’s VIP Coaching Group have told me, at one point or another, that they get incredible support, inspiration, motivation and accountability - not only from me and my team of experts, but also from the other members in our group. We seem to attract a very good bunch of people in this group, which we love! You save money. You won’t need expensive therapy appointments, training sessions, courses or seminars. 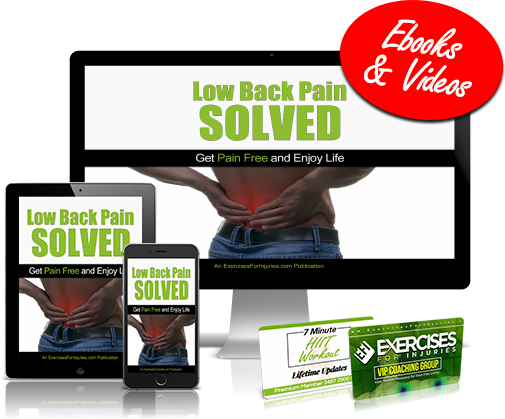 These videos alone can help you decrease and eliminate your low back pain, and they're very affordable! I’ve sold this program in the past for $57, but without all the direct access to me, and all the extra goodies. And there are other programs out there that provide more access, like I do here, but they cost $2,000, even $3,000! You’re not going to pay anything close to that, because I want this program to be available to as many people with low back pain as possible. It’s a shame for anyone with low back pain to go on suffering with it, when my program can help. I know it sounds cheesy, but I would give this program away for free if I could. 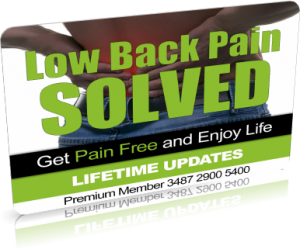 You won’t even pay the $57 I charged for my “Low Back Pain Solved!” product (that didn’t even come with direct access to me and lots of extra resources and extras that you’re getting with the “Low Back Pain Solved!” program). Today, you’re only going to pay a one-time fee of $37. If you don’t get the results you want from the “Low Back Pain Solved!”, you will get your money back. And you have 60 days from your date of purchase to decide. To show you how confident I am in this program. I’ve invested years of my life and thousands of dollars into developing these scientifically-tested exercises, movements, and sequences that you won’t find anywhere else. I want you to know that you have no risk, so you can join this program with peace of mind. I want you to be focused on learning and doing the easy, gentle movements and stretches in this program so you can be free of your pain. I don’t want you to have to worry about whether it’s going to work, or whether you’re going to lose out, or anything like that. With my 60-day, money-back guarantee, you can put your mind at ease and just focus on doing the program and getting better. If for any reason you aren’t completely thrilled with the results you got with the “Low Back Pain Solved!” program, just send my team an email, or call them, and we’ll promptly return your money. Who created the “Low Back Pain Solved!”? after the “Low Back Pain Solved!” program? If you do nothing different, you’ll probably still have miserable low back pain. If you decide to get my “Low Back Pain Solved!”... I am 99% sure that you will see some VERY DIFFERENT results, and you will be feeling A LOT BETTER. ...to see if my program could ELIMINATE YOUR LOW BACK PAIN FOREVER? What if you can ACTUALLY be free of all your pain? No problem. You don’t have to join a gym, or buy any equipment to do the “Low Back Pain Solved!”. All you need is your body and a few household items you can buy at any hardware store, or on Amazon.com. Most of my clients don’t want that either, which is why the duration and intensity of this program (which you can easily adjust if you choose to) are designed not to exhaust you, but gently stretch, lengthen and relax the muscles around your low back and hips. You won’t even break a sweat doing this program! Who is the “Low Back Pain Solved!” for? The only person this program is NOT for, is someone looking for an instant fix or 5-minute miracle cure. There is no such thing as an instant fix or 5-minute miracle cure for low back pain. This program takes some work on your part and takes some time to get the results you want, but the good news is: it doesn’t take very long. Do I have to go anywhere special to be part of the “Low Back Pain Solved!” Program? No – this is a digital program which means you can do it from the comfort of your own home. 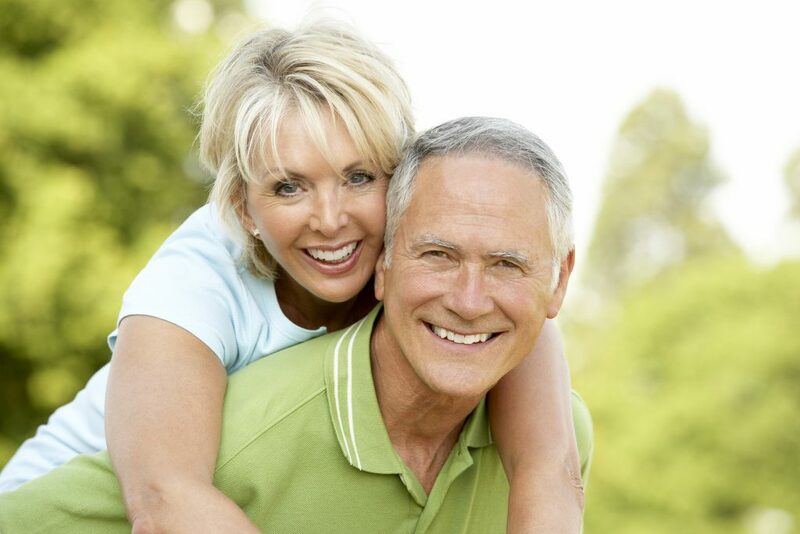 Click here to get the “Low Back Pain Solved!” program. I was surfing around the Internet and found a bunch of low back exercises. Will these help? You can definitely find low back exercises online, for free. 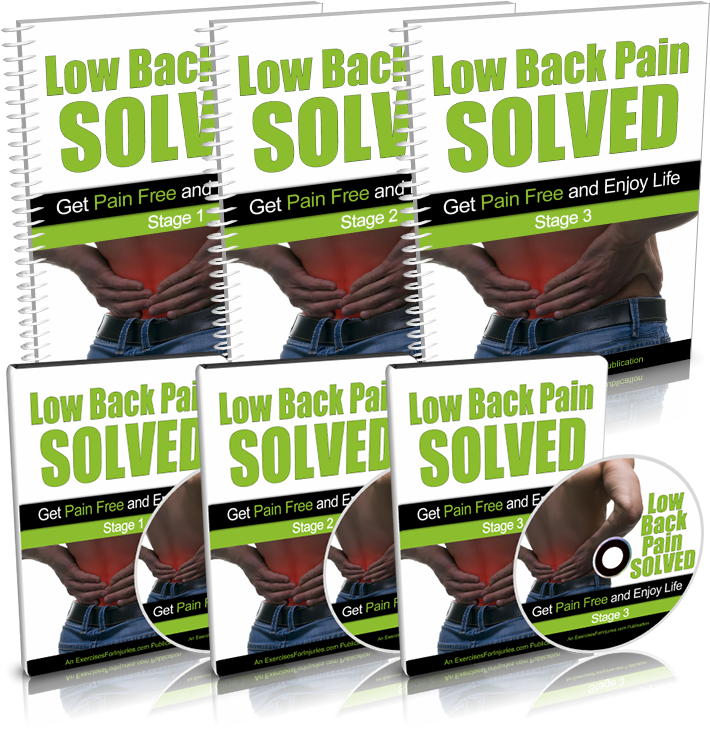 But, you won’t find a complete program designed to apply 8 different approaches to eradicating low back pain, specifically. 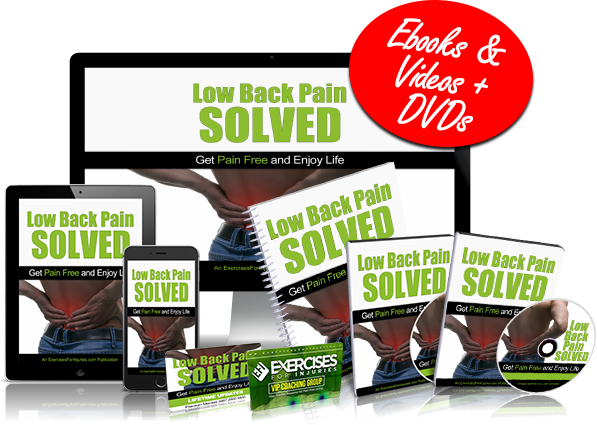 You won’t find a whole program that has been carefully crafted, based on decades of research and real-world testing, that includes ONLY the necessary exercises, with instructions on how to do them in just the right sequence, with the right number of reps and sets, so that you will reach your ultimate goal, which is to be pain-free in your low back, and free of future low back pain flare ups, spasms, and episodes. That’s exactly what the “Low Back Pain Solved!” program is, and does! Yes, and no. Most fitness and health professionals take a shotgun approach to exercises for injuries. They keep giving you more and more exercises, hoping they will help. I don’t do that. My program only includes the exercises you need. I also recommend you do them in a specific sequence and I give you precise instructions on how many repetitions and sets you need to do. My program has been carefully designed, based on years of research and real-world testing, and it is a SYSTEM that has already worked for other people. There will be no guesswork or confusion on your part – everything is laid out and easy for you to follow. My best advice is for you to stop all of the other exercises you are doing, and focus only on the “Low Back Pain Solved!”. How long does it take each day to do the exercises? Each exercise session in this program is designed to take around 11 minutes to complete. It may take a little longer in the beginning as you’re learning the stretches and movements, but you’ll have it down to 11 or 12 minutes in no time because these movements and sequences are very easy to learn. The power of this program is not in the actual exercises or stretches you do, but in WHICH ones you do (and which you don’t), the ORDER in which you do them, and HOW you do them… all of which I demonstrate step-by-step in careful detail in the program. This program is designed for anyone with low back pain, who wants to eliminate it! Can I use the “Low Back Pain Solved!” program if I’ve had an injury or surgery? QUICK-START CHEAT SHEET: A brief overview of low back pain, what causes it, common symptoms, activities that make it worse, and important tips for healing it fast.